Both the Late Show With Stephen Colbert and The Daily Show With Trevor Noah stayed up late on Tuesday to deliver live breakdowns of Donald Trump’s long, rambling, predictably racist and awful (if obediently on-book) State Of The Union speech. Whether or not attempting to cobble together a show’s worth of jokes on the fly in response to Trump’s simultaneously dull and infuriating speech is a better way to cope than stewing alone, drinking, and rage-tweeting is up for debate, although both Noah and Colbert managed to pull off their dissection of the waking nightmare in the White House as ably as they do when they’ve got a little more time on their hands. Colbert, too, approached Trump’s relatively gaffe-free speech as a challenge. (Noah did point out the instance where Trump got one guy’s nickname wrong, then insisted that the guy actually has two nicknames, including the one Trump just made up, since Donald Trump doesn’t make mistakes, dammit.) 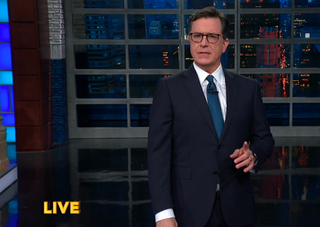 Noting that, for America’s tetchy, erratic toddler president, “the bar for success was pretty low,” Colbert did concede that in “stay[ing] on script, no matter what,” Trump also did at least mostly manage to take a sip of water with one hand, like a big boy. Still, since no one who’s paid attention to anything Donald Trump has said over the past year lends any credence to talk of Trump “becoming presidential” during his carefully prepared (by other people) remarks, Colbert lobbed on-target jokes intended to blow up Trump’s intentionally amorphous pronouncements. Countering Trump’s whole “lowest black unemployment in history” talking point, for example, Colbert noted that there was one time he can think of where the black jobless rate was pretty much zero, “but only half of Trump’s base wants to go back there.” You get it. While Noah called in the print media for his guest, Colbert went younger, bringing in the energetic podcasters of Pod Save America and 2 Dope Queens to provide some added perspective. From the former, co-host Jon Favreau described Trump’s performance as “a hostage statement kind of delivery,” and referred to the intellectual folly of taking a single speech and divorcing it “from an entire year of actions.” Favreau’s co-host Jon Lovett (like Favreau, a former presidential speechwriter) was perhaps most fired up to dismiss the incessantly, childishly bullying Trump’s hypocritical calls for unity, saying contemptuously, “You don’t get to pretend that the last year didn’t happen.” You know, as much as many people would like to.